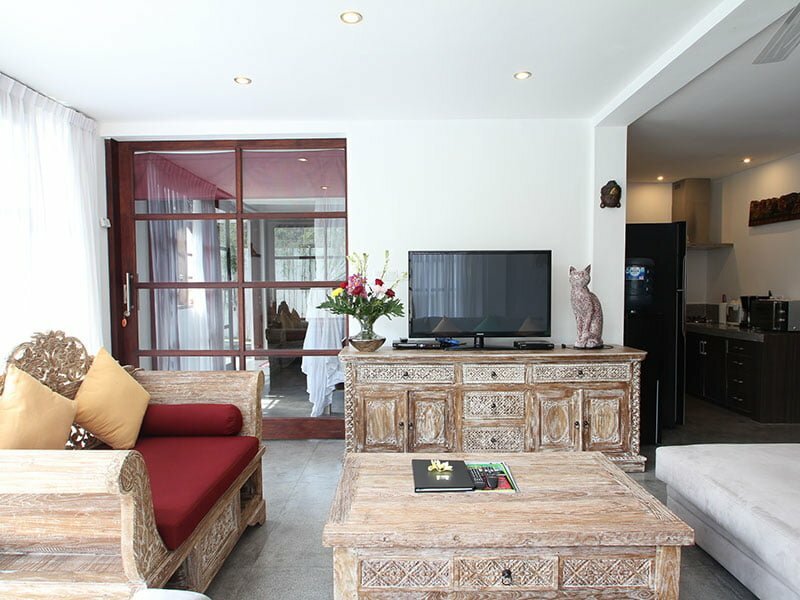 A 3-bedroom exclusive private establishment, Villa Bewa is by far the most elegant vacation spot in Seminyak, Bali. 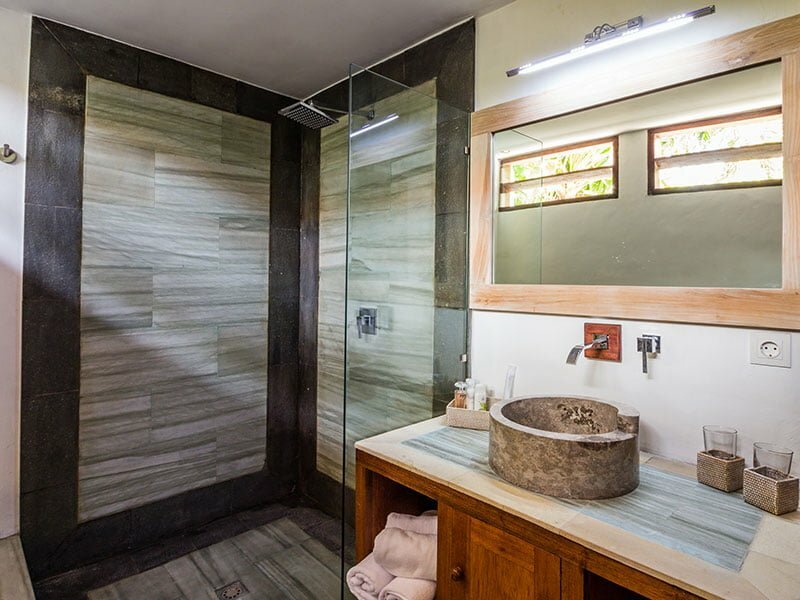 Besides its luscious natural gardens and eclectic interiors, the villa’s grand entrance ushers you to the sparkling waters of its private pool. The establishment is complete with a poolside gazebo, king-sized beddings, housekeeping and security services package, as well as a vast stretching pool. In its vicinity, a comfy poolside corner invites you to bask under the bright sun on the purposely set up red sun loungers. What’s more, the villa’s second storey welcomes you to an alfresco terrace overseeing the stunning tropical trees. This villa is the ideal definition of out-of-this-world especially with its sunlit living spaces and sought-after locations. While here, you can take an enthralling evening stroll and delight in the engaging crowd of the bustling Seminyak and just in time to bask on the Petitenget Beach to enjoy the golden Bali sunset. 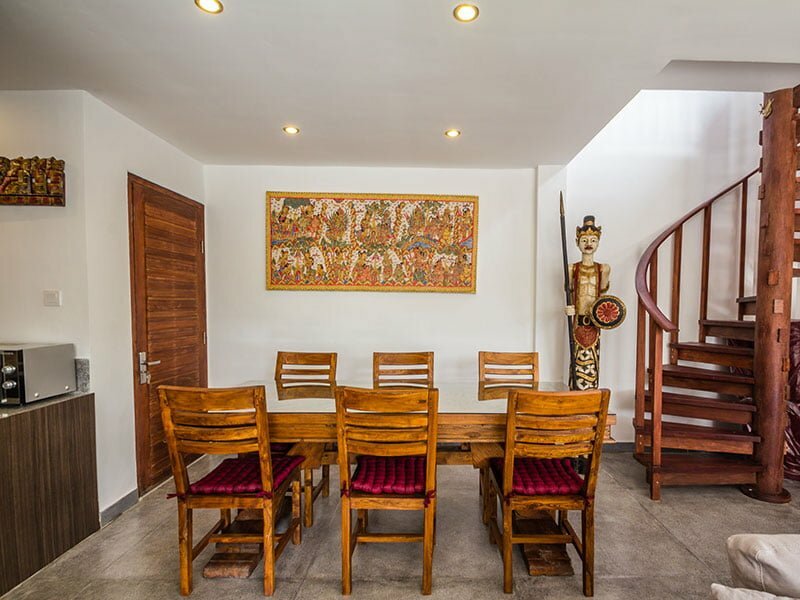 With its proximity to the Oberoi Street, you can quickly get your hands on scrumptious food and the local Bali crafts. The wide variety of culinary options will undoubtedly lead you to ditch your calorie-counting routine almost instantly. While here, remember to embrace and delight in the allures neighboring the villa including Pura Petiteget temple and the Tanah Lot Temple and if you are lucky, you will have the chance to play with mischievous monkeys as well as get to watch the picture-perfect Balinese cliff-side sunset! 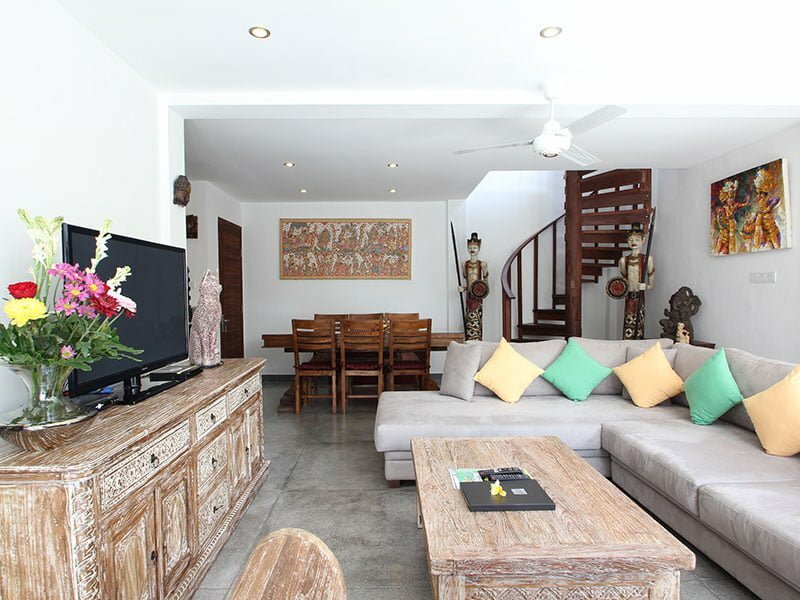 Boasting a laid-back interior, your stay at this villa is sure to be adequately facilitated. 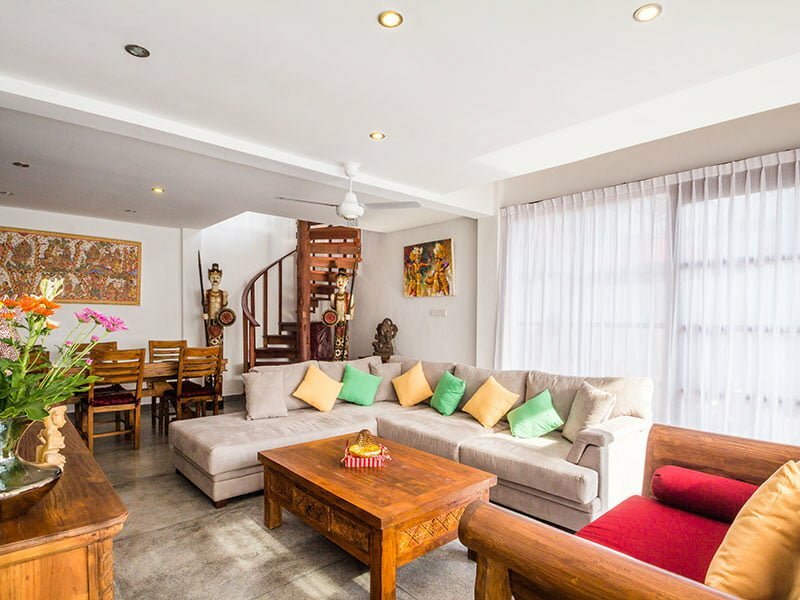 The double-storey villa comprises aesthetically-pleasing interiors with bumpy suede sofas lying amidst walls decorated with framed artwork not to mention a stunning spiraling staircase. In addition, its glass doors grant you undeterred direct views of the outdoors and access to the expansive private pool. 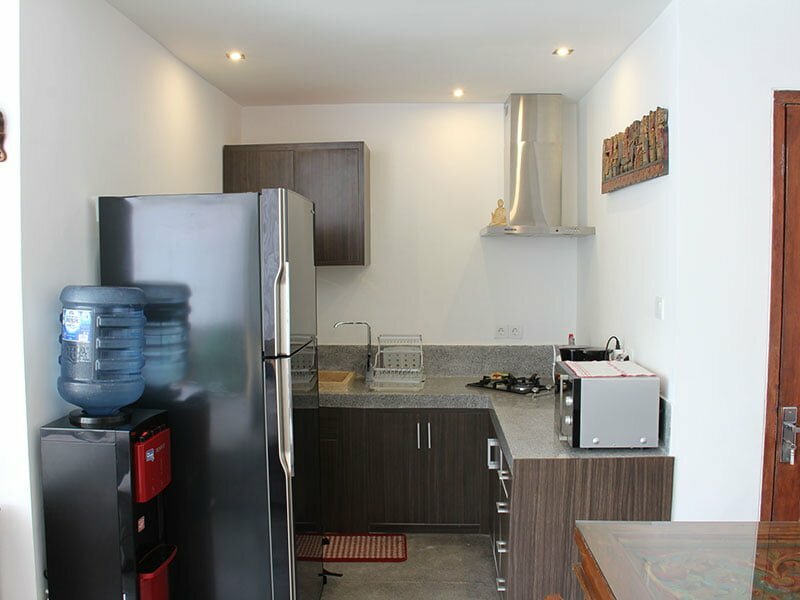 The living area also includes a cozy 6-seater dining table adjoining the well-equipped kitchen. 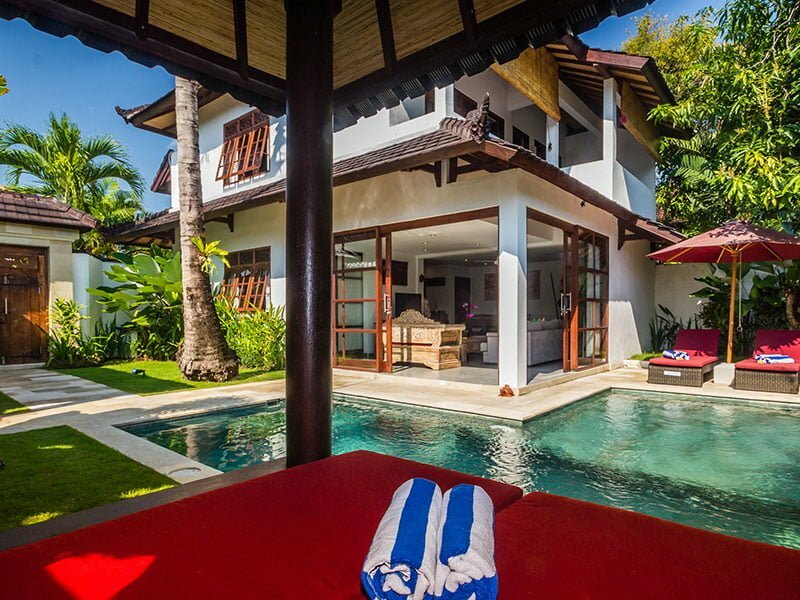 Take pleasure in a soothing lunge in the Villa Bewa pool. Alongside this private pool, the setting is furnished with several red sun loungers and a gazebo that allow you to bask under the Bali tropical sun and a refreshing tropical breeze. The luscious garden neighboring the establishment is adorned with vibrant flowers, luscious greens, as well as tall bustling tropical trees. The pool, which is the highlight of this property, takes up an L-shape and is bundled against the sliding glass doors in the villa’s living space. 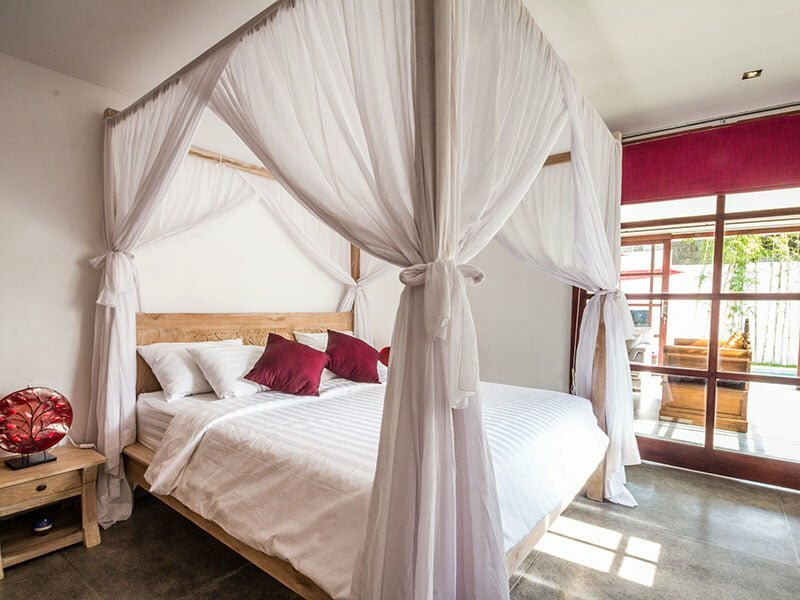 All its two bedrooms come with an en-suite bathroom as well as a king-sized bed. 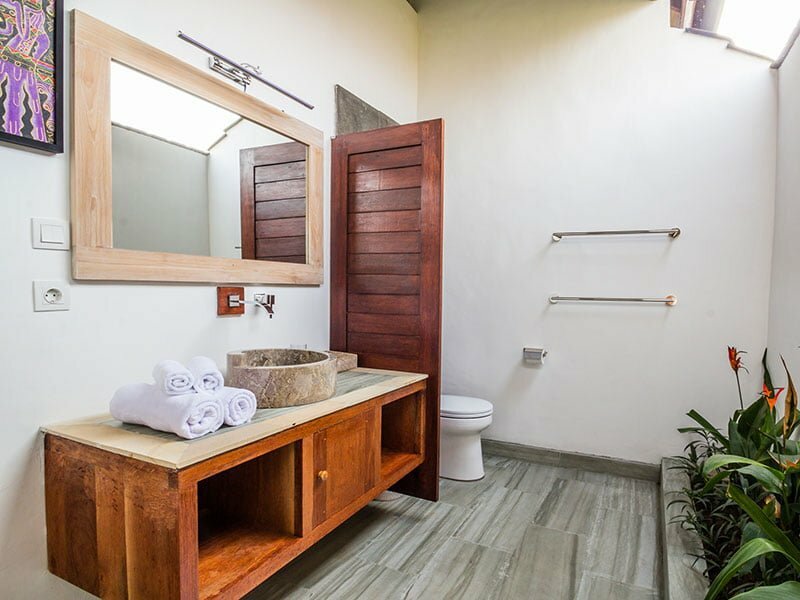 One of the suites is located next to the indoor living space while the two remaining suites are located on the villa’s upper floor. 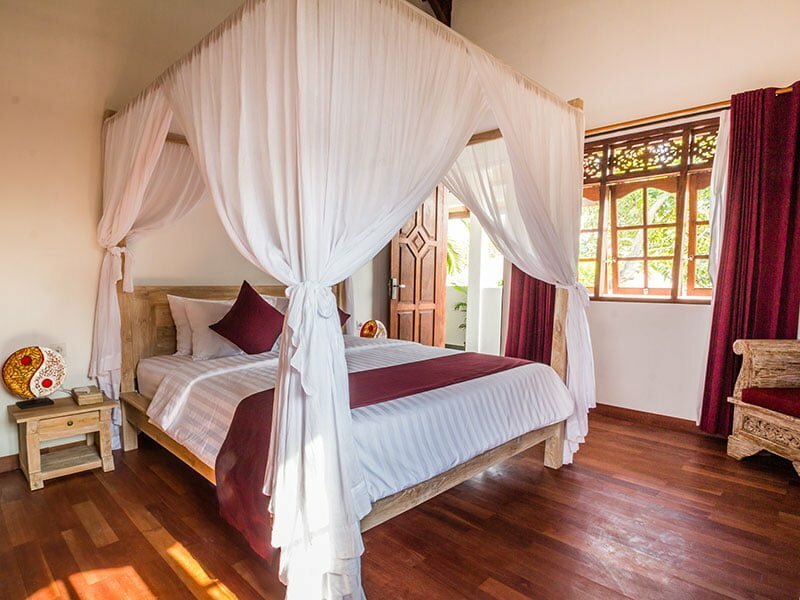 Cohesive vibes of the interiors of all these three suites snuggle shades of maroon, intricately carved wardrobe furnishings and storage chest, as well as roughly-hewn oak canopy beds. 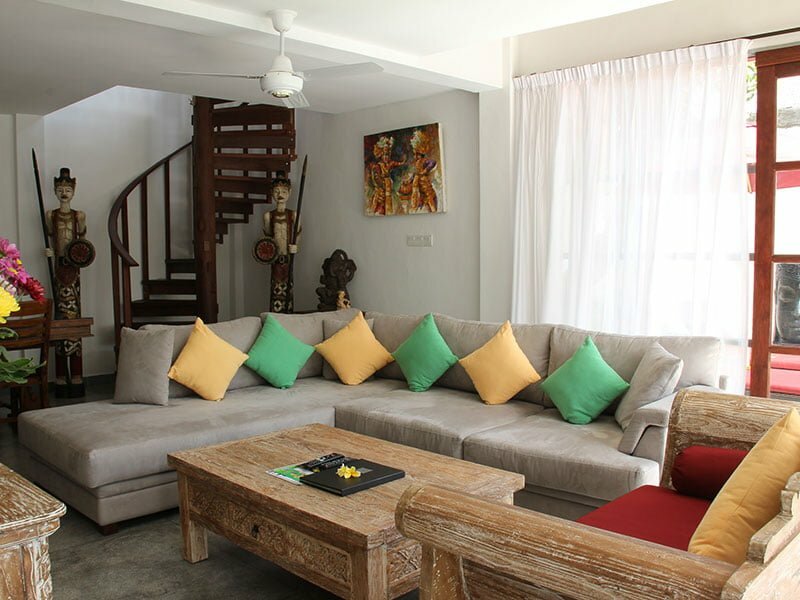 A satellite TV, rustic art pieces, as well as ample air-conditioning are among the exclusive readily-available amenities that make the stay here nothing short of impeccable! 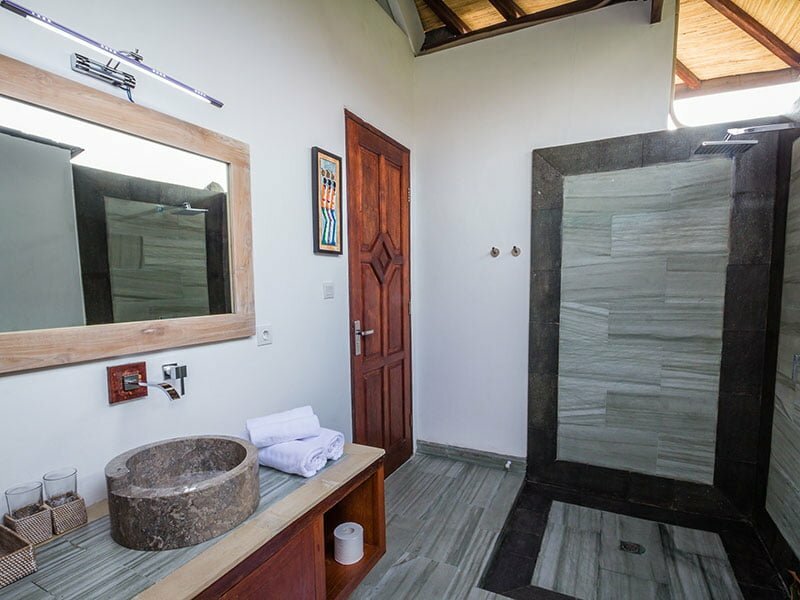 The en-suite semi-outdoor bathrooms are equipped with rain-shower facilities as well as a full vanity set.